Can Affordable Housing Ease Teacher Turnover? Hoping to entice teachers to stick with the job, communities experiment with bold new housing programs. Frustrated by stagnant wages and rising health care costs, teachers in five states pushed back with walkouts and strikes in 2018, with more predicted for the coming fall. As a teacher, I recognize the familiar litany of concerns: rising premiums, insufficient salaries, scant resources, and challenging working conditions—deep-seated problems that have pushed many people to quit teaching, and others not to consider it at all. These issues have escalated as the cost of living and health insurance premiums have increased in step with the country’s economic recovery, while teacher compensation has never fully recovered from recession-era cuts. The strikes proceeded even as some lawmakers and districts around the country have looked for ways to make teaching more sustainable, but the solutions tend to face political and logistical headwinds and are often hard to adapt across a wide range of circumstances. 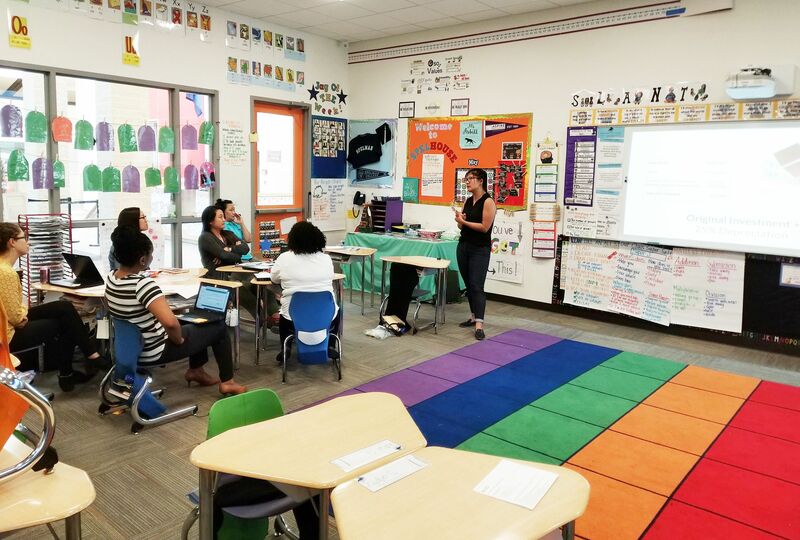 In the 2017–18 school year, Natomas Unified School District in suburban Sacramento, California, began offering stipends and education tuition support to some new teachers. A bill offering income tax relief for teachers cleared the Mississippi House of Representatives, only to die in the state Senate. Other localities have dabbled in offering student loan relief or bonus pay and in covering professional development costs. But much creative problem-solving has focused on tackling another woe: housing. 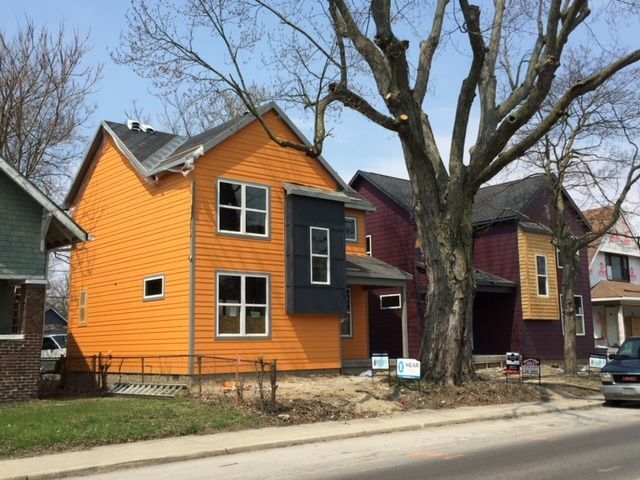 Builders renovate a home for teachers in Indianapolis. As home prices and rents have skyrocketed, teachers have increasingly been unable to live in the communities they serve and are saddled with long commutes that add to the stress of the job. According to a Learning Policy Institute analysis, nearly 25 percent of former teachers said housing incentives might entice them to return to the field. Because it’s less reliant on policy changes or legislative gridlock, housing may be easier to address, but a home is also powerful and meaningful, connected to a sense of belonging and the desire to put down roots. I know from years in the classroom that teachers want to live close to work so they understand the environment that shapes their students’ lives. This context helps foster deep relationships with students and their families that extend beyond lessons and grading—and these types of relationships, research shows, can help improve student outcomes. Teachers also want to be able to coach teams, participate in activities, and show up at events—not rush to get on the road to beat traffic. I live an hour and a half drive each way from the school where I teach. I leave for work at 5:30 a.m. and rush out of school at the final bell. I can’t tutor, lead clubs, attend games, or go to plays because I won’t make it in time to pick up my daughter from preschool if I do. And while I’ve tried to explore the neighborhoods near the school, these experiences barely skim the surface of understanding the community my students call home. I know this lack of context impacts my relationships with my students and my general presence in their lives. While housing is by no means the answer to all the challenges associated with teaching, efforts to help teachers afford a place to live serve two purposes: reducing the cost—and the anxiety—of living on a relatively fixed salary as a teacher, and improving the impact a teacher has on students. When the nonprofit Near East Area Renewal (NEAR) unveiled its affordable housing plan for teachers at town halls in Indianapolis, more than 200 interested teachers showed up. The city loses nearly 400 teachers a year, with many flocking to suburban schools where the salaries are higher and the housing is more affordable. The nonprofit organization NEAR is renovating and selling homes to teachers at below-market rates in Indianapolis. Located in the city’s up-and-coming St. Clair neighborhood, the Teachers’ Village offers newly renovated two- and three-bedroom homes at below-market prices. By July, 15 homes will have been completed; seven more are expected to be ready within the year—a small dent in the housing shortage, but at least a start. 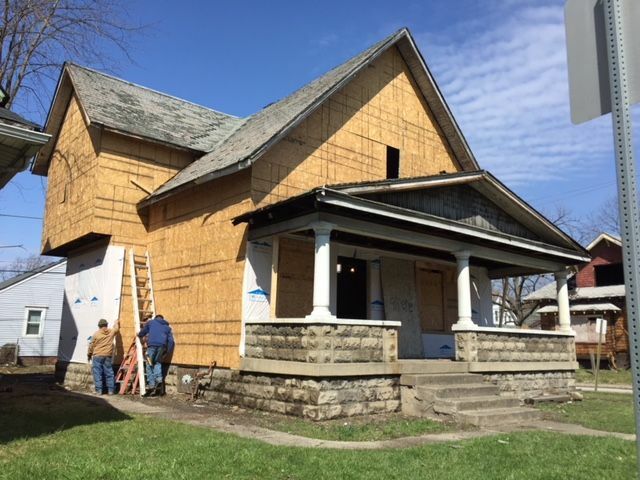 Some teachers have pulled out of the process due to the pace of construction or because they did not qualify: NEAR criteria mandates the buyer can earn no more than 120 percent of the Marion County median income to purchase a home. Other communities are launching similar plans. Dare County, North Carolina, offers two affordable apartment complexes just for teachers. Newark, New Jersey’s $150 million, 400,000-square-foot education community houses three charter schools, subsidized teacher housing, and amenities, and cities like Hartford and Chicago have followed Newark’s lead. And in Miami, the school district is now incorporating residential wings for educators into the designs of new schools; some educators think these plans take the concept of living close to work too far. When a teacher in the sprawling 425-square-mile Vail Unified School District in Arizona joked about capitalizing on the tiny home trend to solve the local teacher housing challenge in a staff meeting, the conversation quickly turned serious. 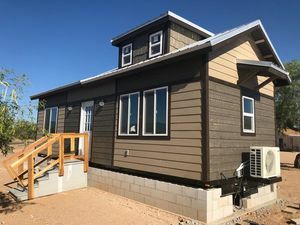 The first home in a new tiny home community for teachers in Vail, Arizona. In Vail, located about 20 miles outside of Tucson, Arizona, there are very few apartments, so teachers typically commute from Tucson or rent houses that stretch their budgets, said John Carruth, the associate superintendent. 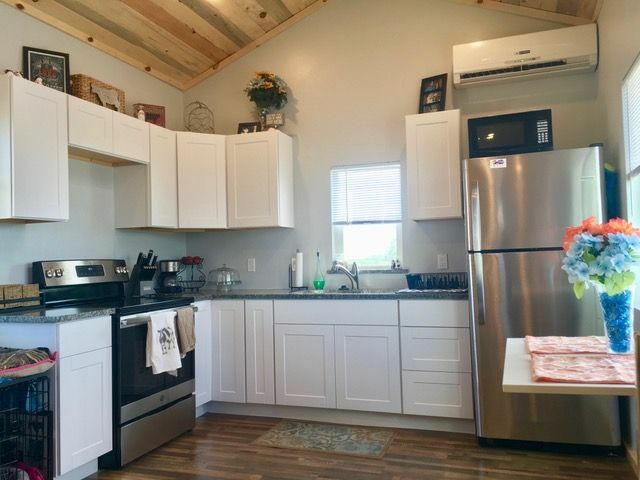 After a number of teachers expressed interest in tiny homes, the district agreed to provide 14 acres of its land and link teachers with a builder that builds customizable 400- to 500-square-foot homes, mortgaged at roughly $500 a month. The district is working with the local credit union to help teachers purchase the homes. 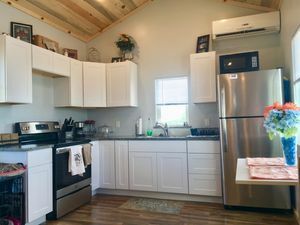 The kitchen of the first tiny home in Vail. The first home, designed for an elementary school teacher, arrived at the site in mid-May. Eventually, this tiny home community may have up to 24 houses. With that in mind, Lofton and a partner founded Landed, a financial company that is offering down payment assistance to teachers hoping to put down roots in increasingly prohibitive real estate markets. “We need to build more housing and pay teachers more, but the down payment is a barrier we can address [now],” Lofton said. Currently, Landed serves teachers in expensive areas of Colorado as well as the Bay Area, Los Angeles, and Orange County, California, providing up to half of a qualifying participant’s 20 percent down payment in exchange for up to 25 percent of the profit from an eventual sale. The borrower must also pay back Landed’s share of the down payment, but the loan is interest free. A Landed staff member talks to teachers at a school. The company offers down payment assistance for teachers who want to buy homes in expensive real estate markets. Over 80 teachers have purchased homes with help from Landed so far, and the company has plans to expand to San Diego, the Pacific Northwest, Hawaii, Salt Lake City, and Austin, Texas, by 2019. Even more effective could be a monthly housing stipend provided by the federal government, according to Azalea Renfield, a counselor for East Palo Alto’s Rent Stabilization Program and the founder of United Educators Association for Affordable Housing, a Bay Area–based nonprofit. Renfield, who is married to a serviceman, wants educators to receive a housing allowance similar to the stipends military families receive. Because she envisions the money flowing in monthly from the federal government, Renfield’s concept departs considerably from the housing stipends offered by some teacher residency programs like the San Francisco Teacher Residency and Teach NYC, or school systems that have given housing assistance to recruit teachers to their districts. Critics of housing proposals argue that the plans aren’t scalable—they will never offer the volume of housing needed by teachers. Others point out that the constraints of living in communities like a Teachers Village could add to a teacher’s stress and the feeling that the job is never done. There’s also an issue of choice: Not everyone wants to buy a house or put down roots. Since most of these proposals are relatively new, there isn’t hard data that proves any particular model effectively curbs teacher attrition or is scalable nationally. But according to Anne Podolsky, senior researcher at the Learning Policy Institute, that’s simply due to the lack of collection efforts, not proof of the contrary. Ideally, good teachers would live in the communities they serve and improve opportunities for generations of students. Yet as salaries stagnate and housing prices rise, particularly in urban areas, good teachers will continue to quit because they can’t afford to keep teaching, adding to the growing problem of teacher recruitment and retention. And that’s a big problem to solve: According to a report from last year, recruiting, hiring, and training a new teacher can cost a district close to $20,000.